Probably the most popular vehicles to build MOCs are the Supercars. We all love cars and the more fast and sports better, but if someone wants to make a Technic Supercar in big size and some complexity (scale 1/10 is the most used) and you don't have a good knowledge of the techniques, build it can be very complicated and end up as hopeless. This system was created with the idea of ​​helping all those people who want to make a supercar at scale between 1/9 and 1/10 and still not have enough knowledge to start, or want to make a car with more advanced specs as Ackerman steering, camber angle and do not know how to do it. What is a Modular Platform System? 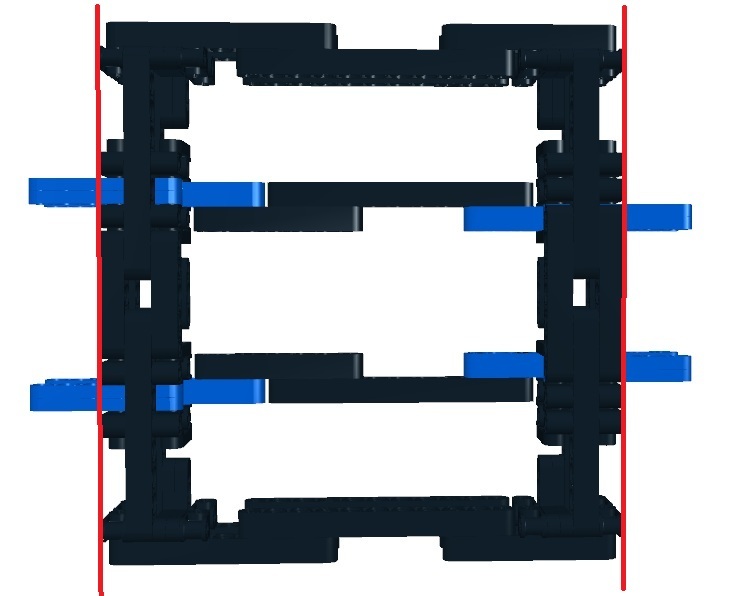 A modular platform system is a set of mechanical elements 100% compatible with each other to suit your needs. In this case the system haves of three elements: front axles, central chassis and rear axles. These elements are designed so that you can combine as you like, you choose the front axle you want, the frame that you like and rear axle, join it directly and you have your perfect base for your Supercar!! 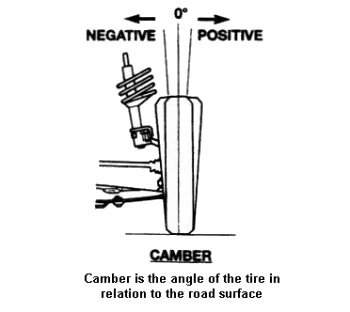 All axles are designed and tested for use 68.8x36 ZR tires which are very common and good aesthetics. - The axle only can be attached to the chassis through the support points. 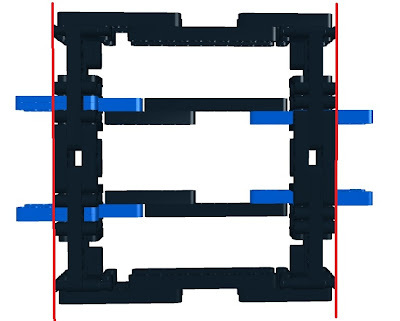 - The drive shaft must enter into the chassis by the center and 3 studs high. - The drive shaft has to turn left when the car goes forward. - The distance between the start of the chassis support point and the center axle of the wheel must be of 7.5 studs. Note: green axle joint in the digital model indicate the steering drive. Notes: Another information about the chassis. - The distance between the start of the chassis support point and the center axle of the wheel must be of 5.5 studs. You can download all axles and chassis in only one file, just go to the INSTRUCTIONS page, and go to the Download folder. Thanks for all you have done. how do u make the camber angle? This is amazing! Do you plan to make 1/7.5 or 1/8 scale versions? When we download the mps and open a document in SR 3D Builder as we rotate the object? But I can not be the same! I am hoping to use this system to make a new 2012 Ford Focus. I was hoping you could help me with your technic magic by designing a multilink rear suspension similar to the Control-Blade multilink rear suspension used in the Ford Focus. I dont need it too soon so i can wait until your current projects are complete and you have the time. Thank you. how do i get instructions from the files provided???? Are you serious? you only need search in google "sr3d" and the first result is the web of the program... search before as.. I would only like to suggest one improvement to your site, if you have the links take you to the system stated, that would be nice. Sorry but I can not understand you, what do you mean? You are awesome, I am wondering why you are doing Civil instead of Motorsport/Automotive? I have just completed third year of Motorsport Engineering. I can open it correctly, maybe you need reinstall SR3D. I absolutely love your work, Sheepo, but I only wish that somebody would finally make some .PDF files for the MPS instructions and parts lists, because my computer cannot open the SR3D at all. Is there any possibility for that in the near future ? Yes, this is an awesome creation, but I don't want to download SR3D Builder because of the numerous system requirements. 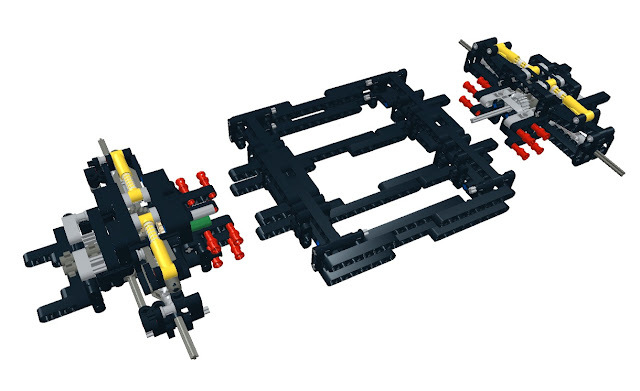 PLEASE make a Lego Digital Designer file, or even better, a PDF file for instructions. Please make a PDF! hey sheepo, i am trying to download the mps stuff on a mac (for a corvette project) and whenever i try to open a file, it says that i "don't have an application to open it in" or something like that. do you have any idea why, and if so could you tell me? thanks! how to open these files? Do you use this system in your super cars ? No, I use even more complex axles. But actually the main axles are very similar. Hello Sheepo. I'm making a Porsche 911 Targa awd. I need a Mac Pherson suspension with drive. When I download your instructions, it won't open and make an error. Can you help me? Hi Sheepo. Can you make a front multilink with drive? Does front multilink even exist? Hi. I have designed your mc pherson but my shock absorbers, wrecked and it,s kind of not straight when you look at it from hieght. Is this normal or not? I found the problem thanks. I wanted to know does the axle has tow in or tow out? And can you tell me how to get Sr3d? Do I need other programs? Because I was watching the instructions in my friends laptop. Thanks. I can't Have sr3d builder can you publish it in pdf ? I Hope you send the instrucions to the email adress.